The new system can transmit more channels without altering the configuration of the headend or transmitter. This is made possible by substituting a transmitter channelized by one providing broadband frequency agility within the band. This system is giving digital television coverage in the region around the city of Reynosa, in Mexico, near the Texas border. This project was implemented by a team of experienced technicians and engineers from RBA CATV with the technical support of the Cable AML team. coverage to nearby cities using links and repeaters. 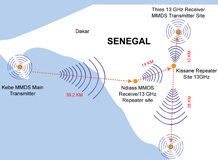 The digital TV signals originate in the existing digital MMDS system in the country’s capital, Dakar. A microwave link using broadband microwave radios from Cable AML is used to transport the digital signal 14 Kms to a repeater point at Kissane. From Kissane it is relayed to two new MMDS sites, one at Thies 10 Kms away and the other at Mbour, 28 Kms away. 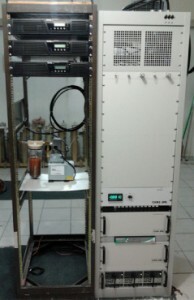 A broadband MMDS transmitter then re-transmits the signal for local subscribers at the two cities. The installation and commissioning of the system has been under the technical direction of David Vine, who has previous experience with both DTT, MMDS and digital cable systems. MMDS operator C-Gates, the leading MMDS operator in Lithuania, successfully concluded the installation and commissioning of a new broadband 500 Watt Cable AML transmitter to cover the Vilnius Metropolitan area. The new transmitter operates in the 2.2 to 2.3 GHz band, which has been recently made available for MMDS service in several countries. The digital MMDS system operates under harsh environmental conditions, specially low temperatures, as can be appreciated by the attached photos. 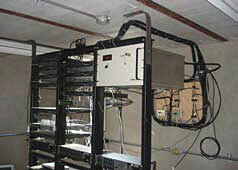 Cable AML has also supplied repeaters to extend the coverage of the transmitter to shadow areas. Cable Onda, the leading Cable TV and MMDS operator in Panama, has concluded a conversion to digital of the existing MMDS analog system which had been operating for more than 20 years. Phase I of the system upgrade included the implementation of a cable-compatible MPEG2 digital headend, integrated with a new CAS (Conditional Access System) and the replacement of the old channelized transmitter with a new solid-state dual-redundant broadband transmitter. Phase II was focused on updating subscriber installations and installing repeaters to improve signal coverage in certain areas. Given the much higher capacity of the digital system, the conversion has made it possible for Cable Onda to improve significantly the number of TV programs available to its subscribers. MMDS operator TV ZAC has just expanded its network coverage area to deliver multichannel video to all major urban centers in the State of Zacatecas (North-Central Mexico) and surrounding rural areas. At Fresnillo, a 1000 Watt transmitter was installed recently to cover the city and nearby rural areas with significant demand. 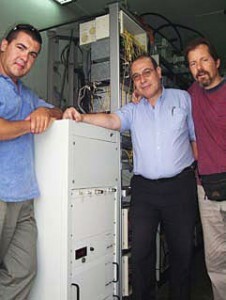 A 100 Watt repeater in Cañitas and a 250 Watt repeater in Villa de Cos expanded coverage of the main transmitter to important nearby communities. Another 100 Watt repeater covers the town of Rancho Grande, where a large number of new users have access to multichannel TV programming for the first time thanks to the system designed by Cable AML. The expansion plan included upgrading the main Zacatecas transmitter to 500 Watts to cover the capital city and strategically located repeaters nearby. A new 250 Watt repeater in Santa Monica has been installed to provide coverage in the Western part of the state. 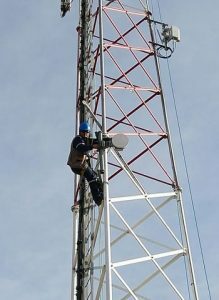 A new transmitter was installed in the city of Monte Escobedo to provide coverage to the entire urban area. Similarly, a new 250 Watt transmitter has been installed in Valparaiso at the confluence of Durango, Zacatecas, Jalisco and Nayarit, where two repeaters (one at Lobatos and one at San Mateo) serve adjacent communities and the surrounding semi-rural areas. 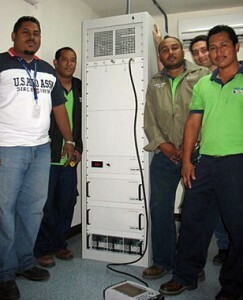 Cable Onda, the leading Cable and MMDS operator in Panama, recently upgraded a high power MMDS transmitter in the city of Colon with a 1000 Watt broadband transmitter from Cable AML.The old channelized transmitter was involved in a fire emergency and ceased to operate without warning. Cable AML supplied an off-the shelf 1000-Watt broadband transmitter which arrived to the site the following day. The Cable Onda technicians, led by Luis Valle, had hit installed and operating in less than 2 hours after arrival, thus minimizing service disruption to Cable Onda’s MMDS customers. Servicing the broadband needs of Mexico’s 110 million people is no small task. “Everything flows from reliable equipment, which is why we chose Cable AML,” said Ing. Fernando Villaseñor of Multivision. 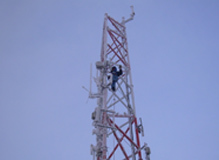 Multivision’s most recent purchase of Cable AML transmitters was part of an on-going program to install new transmitters as well as upgrade some of the 31 transmitters installed by Cable AML in 2003. The upgrades were designed to boost the output power so as to increase the coverage area. “The ability to upgrade transmitters in the field is a result of Cable AML’s deliberate adoption of the modular design concept, which is based on common blocks of discrete components to ensure not only upgradability but also long life and ease of service and repair,” said Dr. Francisco Bernues, President of Cable AML. Multivision serves markets that are often separated by hundreds or thousands of kilometers in places like Acapulco, Culiacan, Durango, Hermosillo and Mazatlan. 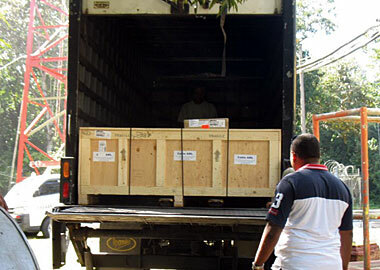 The distance alone can make it difficult to coordinate shipping and installation. Cable AML relied on its years of experience delivering products and services worldwide to meet the challenge. “We provided the customer with fast delivery, customized logistics and complete solutions packages including antennas and accessories shipped, prepackaged to each of the 12 different destinations, plus 24/7 support in Spanish,” Dr. Bernues said. Univisa, the largest MMDS Company in Ecuador, has recently completed the upgrade of two of its largest MMDS systems from Analog to Digital using Cable AML broadband high power transmitters. Univisa had been operating for several years an analog MMDS system in Quito and Guayaquil, the two largest cities of Ecuador, and decided to upgrade to digital to increase the number of TV programs from 31 to more than 68. The upgrade consisted of a digital Headend feeding a broadband 1000 Watt transmitter capable of reaching over 40 kilometers with a load of 10 digital carriers (60 to 80 TV programs) modulated in 64-QAM. 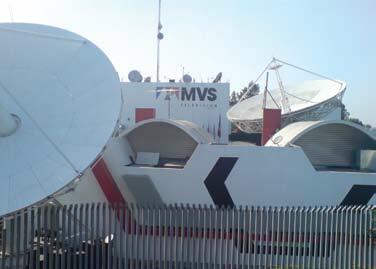 A new, 200-Watt broadband MMDS Repeater was recently installed and commissioned by Multivision to provide MMDS coverage in the area of Quillacollo, 14 Kms from Cochabamba in Bolivia. A broadband, 100 Watt transmitter delivers the signal from the Headend to the new repeater. The system currently operates with 62 analog channels but will soon upgrade entirely to digital. The new repeaters will not require modifications when the switch-over to digital takes place in the near future.All Cable AML’s transmitters and repeaters support analog signals, digital signals or both simultaneously. Multivision uses Cable AML repeaters at many of its repeater sites. Another 200 Watt repeater has operated continuously without incident for the last 5 years. 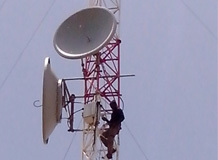 A digital MMDS system covering a range of approximately 30 Km radius from the main transmitter site at Renala in Pakistan has installed and commissioned a link to feed the same headend signal to a new transmitter at 55 Kms from the main headend. The new 250 watt transmitter provides coverage to an area of approximately 20 Kms radius from the broadcast tower. The repeater link was implemented by a broadband AML link fed directly from an MMDS pick-up antenna at the relay site at Ghamboor, about 30 Kms from the main transmitter site. Omar Nazir, President and CEO of RANJA Enterprises, the operator of the state-of-the-art digital MDMS system, said, “The new link and transmitter have allowed our company to significantly expand its coverage footprint from the same centralized headend, significantly expanding our customer base without the expense of installing or operating a new headend. 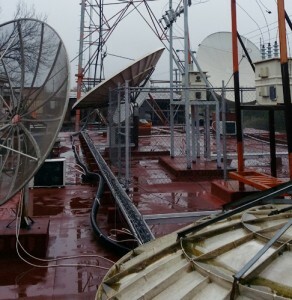 A digital MMDS system based in Gulang, Gansu province, People’s Republic of China, has been recently installed using Cable AML outdoor broadband transmitters and repeaters. The systems marks the first extensive use of outdoor MMDS transmitters and repeaters in a digital MMDS system. The system, designed and installed by GS Enterprises, has a total reach of 100 Kms. A 4 Km fiber link connects the digital headend to the main transmitter, which is an outdoor 100-Watt unit providing service to an area of more than 50 Kms radius. 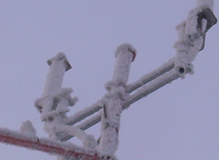 At 45 Kms from the main transmitter, an in-band point-to-point repeater link, implemented with an outdoor transmitter, trans-ports the signals from Heichong to Qingshansi, 20 Kms away. In the final leg of the system, an outdoor 50-Watt repeater is used to provide service to customers in an area of more than 35 Kms radius. Cable AML’s technology has made it possible to implement digital MMDS systems at a fraction of the cost of channelized analog systems installed only a few years ago. MVS Multivision, the world’s largest MMDS operator, has upgraded the MMDS system in Pachuca (Hidalgo, Mexico) by installing a higher power transmitter module from Cable AML. Pachuca is a city about 90 Kms from Mexico City with a large and growing market for multichannel TV service. The city has an estimated 30,000 TV homes in an area of about 60 square kilometers. The upgrade and expansion project consisted of installing a high-power amplifier module to increase the output power of an existing broadband transmitter to a total of 500 Watts. Additional channels were also added to provide full 31-channel service. “With the new transmitter, an excellent quality picture is delivered to the entire metropolitan areas aid Ingeniero David Velazquez of MVS Multivision. ACOM Comunicacoes, the leading Digital MMDS system operator in Brazil, has just installed a new Cable AML 1000 Watt broadband transmitter in Manaus, to improve its digital MMDS service in this city. ACOM has other 3 digital systems in operation in Brazil. The new system in Manaus is designed to provide service in an area of over 20 Km radius with more than 200,000 TV households. Cable AML is also providing a number of two-way repeaters, which will enable ACOM to offer service in shadowed areas where there was no previous service available. Cable AML has concluded the upgrade of an analog MMDS system, increasing program capacity six-fold and at the same time providing signal security. The system is located in the Los Angeles metropolitan area. The system can now transmit 6 TV programs in the single 6 MHz slot previously occupied by one analog program. 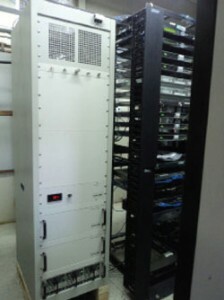 Cable AML provided an integrated system consisting of a digital headend with integrated CAS (Conditional Access System), upgraded the existing STL (Studio to Transmitter Link) that transmits the signal from the TV studio to the transmitter site in Beverly Hills, and provided a new broadband MMDS transmitter and all of the subscriber set-top boxes. A newspaper article in the April 17, 2004 issue of the Nippon Keizai Shimbun, a prestigious international newspaper, reports on the successful installation and demonstration by V-Network Systems of a 23 GHz Digital TV System in the village of Shiramine, Ishikawa Prefecture, North-Central Japan. The site was selected in part because, due to its location in a mountain area, it is covered by snow during most of winter.News of the trial system was also reported by the local newspaper (Hokuritsu Chunichi Shibun), which said that the system has been approved for a trial phase until March 2005, pending final approval by the Japanese Government. 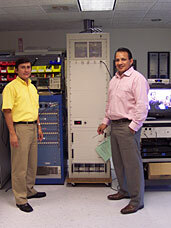 The wireless CATV system was designed and manufactured by Cable AML for V-Network Systems. It includes a digital headend based on the DHM-4001 module. The headend signal is fed to a solid state broadband transmitter integrated with 90 degree sector antennas. Subscribers use roof-mounted receivers with parabolic dish antennas 24 cm in diameter. Coverage extends to 2.5 km from the base station. System range was verified with fixed and mobile equipment. An antenna was successfully mounted on a van to verify coverage over the whole area. According to V-Network Systems, the system cost is estimated to be 67% lower than other options currently available and could be further reduced as volume increases. A new Multichannel Digital TV Broadcast system operating in the 28 GHz band has been recently installed to provide multichannel TV to potentially thousands of subscribers. The system has been installed in four cities. Operating in the 28 GHz frequency band, the system features state of the art broadband transmitters with initial capability for 20 DVB-C data streams modulated in 64QAM for a total capacity of 100 TV programs. In addition to transmitters, the system uses inband repeaters to provide a wider coverage area than achievable with a single base station. This frequency reuse method allows for a wide foot print at reasonable cost. A single CPE downconverter can provide service to a single subscriber, or, more commonly to many more subscribers connected by a conventional coaxial TV distribution network, such as is available in multi-family dwellings. 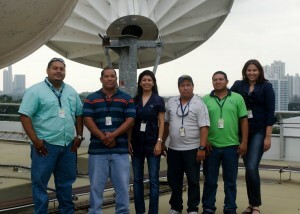 Following the launch in 2012 of the digital MMDS system in Panama City by Cable Onda, the leading Cable TV and MMDS operator in Panama has been expanding digital coverage across the country. The network expansion plan, which is still in progress, has been implemented by installing a combination of repeaters with upgraded transmission plant and also fiber-fed transmitters in those areas where coverage and/or line-of-sight conditions recommended this approach. The plan, which is undertaken under direction of Melisa Perez, is being implemented by a team of experienced Engineers and Technicians. Detailed site coverage and interference analyses were conducted by Mrs. Perez and her team prior to each site installation. Following installation and commissioning, the coverage analysis is verified in the field by implementing a detailed signal analysis and coverage protocol program by the Cable Onda team. An analog MMDS system was upgraded to digital by Rios & Cia in Santiago, Capital of Chile.The system now transmits multiple sports events from two different venues in high-quality HD Video format to more than 100 locations around the capital city of Santiago de Chile. The upgrade implemented by Rios & Cia included the design of two headends for HD signals encoded in MPEG-4 format as well as the simultaneous upgrade to digital and frequency migration of two redundant PTP links feeding a redundant broadband MMDS transmitter. Following concurrent transmission of analog and digital signals during a test period, Rios & Cia has recently completed upgrading the remote receive stations prior to commissioning of the system. Megacable, Mexico’s largest Cable Operator, has recently converted the analog MMDS system in Ciudad Juarez (Mexico) to a digital MMDS system which is the first operational system in the world transmitting with 256QAM modulation. The Megacable system is designed to provide increased spectral efficiency so as to package a higher number of TV programs in less spectrum than older systems, thus allowing the simultaneous transmission of analog TV, digital TV and wireless Internet access. The analog-to-digital MMDS conversion plan was devised and implemented by Megacable’s technical staff and it included a new digital Headend as well as a 1000 Watt broadband dual-redundant transmitter from Cable AML. Multiseñal, the largest MMDS operator in Uruguay, has just started its MMDS digital transmission. The company has been operating an MMDS system for 15 years in Montevideo, capital of Uruguay, and in the adjacent urban and rural areas. The system has been transmitting 15 analog channels and is now adding three digital carriers with up to 12 TV programs in each 64 QAM transport stream. The system upgrade has been implemented by transmitting the digital signals via a broadband transmitter from Cable AML, which complements the existing bank of channelized analog transmitters. The transition from analog to digital has been initiated by offering a package of 33 digital programs to the same subscriber base, while continuing transmission of the same package of 15 analog channels. The robustness of the digital signal transmitted allowed a large number of customers to make the switch from analogue to an auto-installed digital set top box. Customers picked up the digital STB and connected it themselves. This enabled a fast and inexpensive way to swap boxes. It isn’t always possible to jump into the latest technology. Sometimes the journey must occur in steps.Viginta JSC Ltd. of Vilnius, capital of Lithuania, wanted to make a leap into digital broadband TV and wireless data distribution to thousands of subscribers in a service area with a radius of approximately 32 Km. The Company already provided this service under the brand name VDNet and wanted the upgrade without interrupting service. So it was most important to plot a detailed transition strategy. Cable AML engineers worked with IT Manager Vytas Mikelaitis to devise a step-by-step transition from their analog system to a new broadband system powered by a 500 Watt transmitter capable of transmitting both digital video and wireless Internet simultaneously. “This was an upgrade and the customer needed assurance the transmitter was going to interface flawlessly with other equipment in place,” said Cable AML President Francisco Bernues. “We made the conversion from an existing channelized MMDS system, which included relocating the transmitter site, converting it from analog to digital and from channelized to broadband,” Dr. Bernues said. 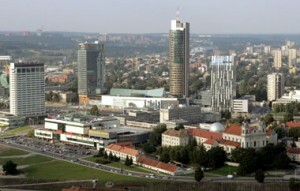 Consumers in Lithuania’s capital now enjoy better coverage and simultaneous transmission of TV and data signals over a wider area with the same “legacy” wireless system that was previously in operation. “We provided a solution, not a transmitter,” Dr. Bernues said. HITRON Ltd. of Port Moresby, the capital of Papua New Guinea, upgraded its 31-channel analog system to a digital system with 100 channel capability.The switch from analog to digital followed installation of an integrated digital headend and broadband, dual-redundant MMDS transmitters. The independent country of Papua New Guinea lies on the mineral rich island of New Guinea. The signal from the headend at Port Moresby feeds part of the city. On-frequency repeaters carry the signal to several remote areas. Careful planning and execution of the switch over minimized disruption to any of the more than 10,000 system subscribers. The digital performance of the system, including the repeaters, was tested by transmitting a single 6 MHz digital carrier with the analog signals. Baja Cable has announced the launch of a digital MMDS service in Tecate, Baja California, Mexico. The launch marks what is believed to be the first operational deployment of a digital MMDS system in Mexico.The service will reach fifty-two thousand households in an area of eight kilometer radius centered in the town of Tecate. The first operational phase starts with transmission of twenty-four TV programs, soon to be expanded to sixty, along with premium packages and pay-per-view. Total system capacity exceeds 120 TV programs. Wireless Internet and telephony services are planned for the near future. The system was designed, fabricated, installed and commissioned in less than 45 days. The digital headend is located on a high hill 25 Kms from the MMDS transmitter. 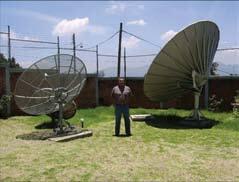 The digital headend signals are sent to the MMDS transmitter in Tecate via an AML broadband microwave link. According to Jaime Bonilla, CEO of Baja cable, “Cable AML has delivered a state of the art system with excellent performance in record time. We are very pleased with the excellent customer support offered to our company during the acquisition, installation and commissioning process”. 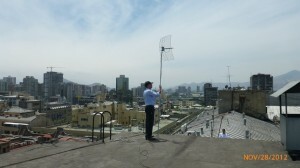 ACOM Comunicações, the leading digital MMDS system operator in Brazil, has just installed two new Cable AML 1000 Watt broadband transmitters in São Luis and Volta Redonda respectively, to power the new digital MMDS service in these cities, adding to the four digital systems already operated by the company in Brazil. Two additional transmitters are being installed in September in two new cities. The new systems are designed to provide service in an area of over 20 Km radius, and are located in cities with more than 20,000 TV households. ACOM Communicacoes, the leading Digital MMDS Operator in Brazil, has started to expand the coverage area of the system in the city of Manaus by installing several one-way and two-way outdoor broadband repeaters. The one-way repeaters provide digital TV service and are mounted in strategic locations selected to provide service in areas blocked by terrain or other obstacles. The two-way repeaters provide broadband TV as well as wireless internet coverage in blocked areas. Frequency-translating MMDS Repeaters from Cable AML were installed by the Caribbean Broad-casting Corporation in Barbados to mitigate interference between adjacent overlapping repeater cells within the service area of the digi-tal MMDS system operating in the Island. When the coverage area of adjacent repeaters overlaps, interference between repeater cells can present problems. Digital MMDS systems have less tolerance than analog systems for this type of same-frequency interference, so Maurice Bailey of CBC devised a frequency-shift scheme to eliminate interference by alternating the 9-carrier spectrum between adjacent repeaters. The subscriber set-tops are channel-mapped to select the appropriate channels in each repeater area and to ignore the undesired carriers. Cable AML has provided CBC with several frequency-translating broadband repeaters to implement this solution in all areas where there is suspected overlap between repeater cells. Cable AML announced in June of 2005 the deployment of a digital MMDS system with 54 channels of full digital video in Okara Province in the North East of Pakistan. The system was commissioned by Ranja Enterprises of Lahore and has been in commercial operation ever since. It reaches subscribers in a 35 Kms radius from the main headend, an area with more than 40,000 potential subscribers. The deployment consists of a fully integrated digital headend including CAS (Conditional Access System) to prevent unauthorized reselling of programming content and to provide multiple program tiers. The system includes a broadband base station transmitter and associated transmission equipment. The system is designed to be easily expanded to provide wireless Internet service as soon as the regulatory authorities provide the permits. Omar Nazir, CEO of Ranja Enterprises selected Cable AML’s system because of the superior technology and Cable AML’s ability to provide the system as a turnkey solution, with full integration of the headend, transmission and subscriber hardware and software. Caribbean Broadcasting Corporation, a leading digital MMDS operator on Barbados, is in the process of upgrading a number of repeaters to improve the overall signal quality, particularly to areas blocked from the mountaintop transmitter by mountains and other obstacles. 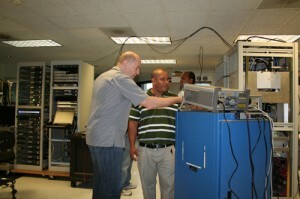 The repeater upgrade is being implemented using high-reliability Cable AML equipment. The high-power indoor repeaters are replacing older units from another manufacturer originally installed when the system was only analog. The repeater sites include a lighthouse and building roofs. Ranja Enterprises of Lahore, Pakistan, last month installed a digital MMDS system in Okara Province of Pakistan. The system is going to be installed in three phases. 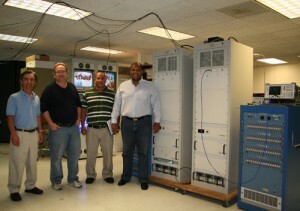 The first phase included a DHM-6001 digital headend module, the output of which feeds a 250 Watt broadband transmitter. The DHM-6001 is capable of digitally encoding six TV programs and then multiplexing them into a single carrier which is modulated with 64-QAM. 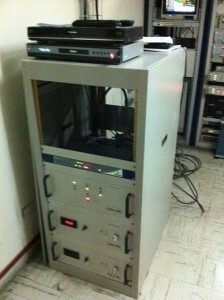 In the second phase, eight additional DHM-6001 units will increase the number of TV programs in the system to 54. The third and final phase of the project will add wireless Internet access, using the same broadband transmitter for the downstream and an MDS band receiver for the upstream. The system uses an omnidirectional antenna on a 60 meter tower and is providing coverage at distances beyond 40 km, as witnessed by Ch. Omar Nazir, CEO of Ranja Enterprises. Installation and commissioning of the system was accomplished in less than 48 hours from the time he equipment arrived in Pakistan, according to Jehangir Khan, Director of Operations for Ranja Enterprises, who was assisted by Zulfiqar Ali of Media Engineering (Pvt.) Ltd., Cable AML’s representative in Pakistan.